As I watched the cricket unfolding at Pallekele during the recent Sri Lanka-India series – with India repeating the ordeal Sri Lanka suffered in the UK at the hands of Pakistan – I thought of these words. They’re not those of a cricket coach but a man who lived and died in 1892 at Loolecondera Estate. James Taylor, the pioneer Scottish tea planter extraordinaire in Ceylon, wrote these words as he complained about instructions received through Colombo from the owners of the tea estate – Oriental Bank Estates Company. He was later sacked by the new owners as Loolecondera tea ceased to command high prices. Taylor suffered from dysentery and died of a broken heart although some hinted that he may have taken his life. Virtually a household name in Sri Lanka, James Taylor was hardly known in his native Scotland. These are some of the interesting details in a new book on him published by Manchester University Press (UK) to coincide with celebrations marking 150 years of Ceylon Tea. We learn many things about him through the book, thanks to the extensive research of its authors Angela McCarthy and Sir Tom Devine who are professors of history. James Taylor was born in 1835 in Auchenblae, in Kincardineshire, Scotland. His father was a carpenter and his mother’s death when he was only nine affected him deeply. When his father remarried, he was no favourite of his stepmother, and life at home became unbearable. Since his father was more interested in the work that his son could contribute towards rather than helping him with his education, Taylor decided to sail to Ceylon having agreed to work for only UK£ 100 a year. He was one of many Scotsmen who flocked to the island during that time. Taylor was first placed on Naranghena Estate in Hewaheta but a mere six weeks later, he was asked to move to Loolecondera. 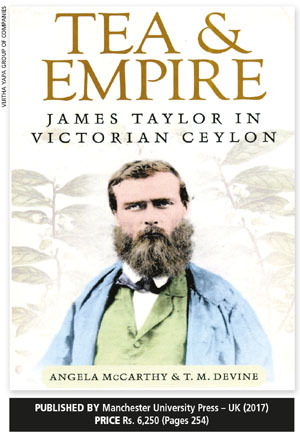 Though known for his pioneering work in tea, Taylor began life in Sri Lanka planting coffee. By 1879, Sri Lanka boasted 310,000 acres of coffee and the product accounted for 85 percent of the island’s exports. The authors reveal interesting details that led to the explosive interest in plantations. In 1829, the colonial office sent a special commission to Ceylon to assess the administration. Its recommendations included a reduction in the salaries of the administrators while both civil servants and army officers were encouraged to exploit the potential of the plantation economy for profit. “This strategy was so successful that it soon became evident that servants of the state were neglecting their official duties in the search for profit in the agriculture economy,” the authors say. Finding labour to work on the plantations was a major issue and as one commentator said, the Kandyans had such reverence for their patrimonial lands that despite the possibility of their gains being quadrupled, they wouldn’t abandon their culture and employ Tamils from India as working for hire was considered akin to slavery. This led to efforts to source workers from impoverished lands and the influx of Tamil workers from India ensued. Some estimate that by 1882, as many as 2.7 million Indian-Tamils had arrived in Sri Lanka. Unfortunately, the coffee blight and fall in demand for coffee led to changes because many plantations collapsed. There was a substantial demand for fertiliser so much so that some estate managers even ordered human excreta to be collected and used as fertiliser. Though hailed as the pioneer of tea plantations, Taylor initially contributed to the growth of coffee with his controversial views on the pruning and growth of cinchona. But it was his success in planting tea on a 20-acre block that etched James Taylor’s name in our history books. Interestingly, the first efforts to grow tea in Ceylon were by two German brothers – Gabriel and Maurice Worms in 1840. But their experiments with Chinese tea were a failure. Taylor also experimented with Chinese tea and told his father that the early results were awful. His letters offer insights into the man’s thinking. My focus has been on the early life of James Taylor, which I found fascinating, as details of his life as the pioneer of tea have received considerable publicity.